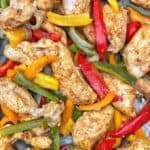 One-Pan Baked Chicken Fajitas making your dinner prep easy, quick, and delicious! I had a ton of peppers left over from my Mexican Quinoa Salad and had some chicken defrosting, so I figured why not make a Mexican inspired fajita dinner? We also had leftovers from the salad so having this sheet pan dinner served overtop was perfect. I swear the flavors just keep getting better and better as it sits. Anyway, this one-pan dinner is so beyond easy. But the best part? It’s freaking delicious. And all you need is chicken, peppers, onion, and spices. That’s it. One-pan chicken fajita sheet meal is so quick and easy to make, and is beyond delicious! Coat veggies and onion in oil. Place on parchment lined baking sheet and bake in oven for 8 minutes. In a bowl, mix chicken and spices until fully coated.